Click on all images in this review for full 1080p screenshots. Let's face it, folks. Studios couldn't care less about the films we grew up with. They'd rather spin their wheels on superhero flicks, horror sequels, and of course remakes and various other nostalgia projects. So, typically, unless our favorite films from decades past have some sort of modern day tie-in to drum up sales interest, those catalog titles are basically doomed to rot in their respective vaults. And yet, sometimes, even that's not enough to make a studio care, and the Bill & Ted franchise is one such example. 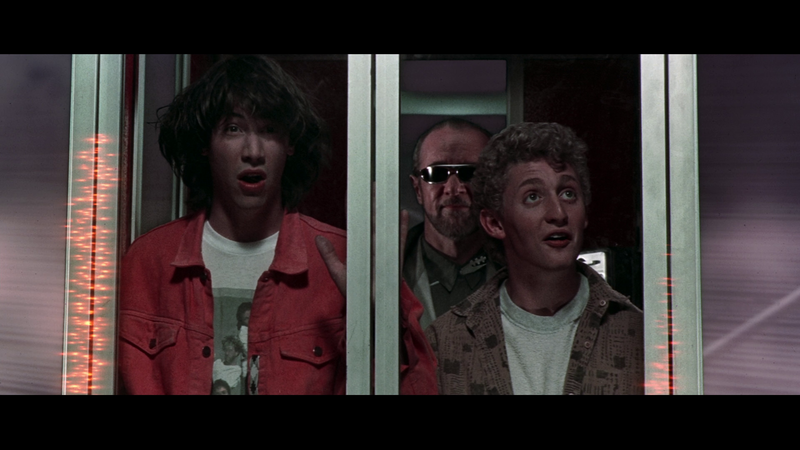 In 2012, MGM (with Fox distributing) had released Bill & Ted's Excellent Adventure on Blu-ray, but despite evidence that traction has been gaining on a third film with Alex Winter and Keanu Reeves reprising their roles, a release of Bill & Ted's Bogus Journey - and please forgive my pun - has been stuck in limbo. Thankfully, small distributors like Shout Factory come along to provide us with products that wouldn't have seen the light of day otherwise, and this time, they're dropping Bill & Ted's Most Excellent Collection. I understand reviews are inherently subjective and all, but holy cow does this guy miss the point. Bill & Ted debuted in 1989, when pop culture had partially revolved around hair metal and grunge. It was also a time when Hollywood was exploiting time travel and ‘singular badass saves the day' plot devices. We're talking Back to the Future, Star Trek IV: The Voyage Home, The Terminator, Highlander, Escape From New York, Conan the Barbarian, Mad Max and more. 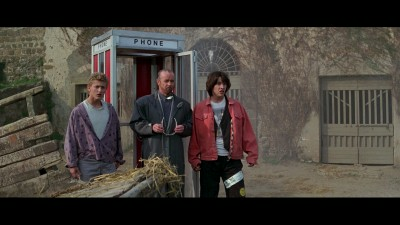 Enter Bill & Ted's Excellent Adventure, a tale about Futuristic City, 2988, when a utopian society - wholly inspired by the music of the ‘Two Great Ones' - has discovered their entire way of life hinges on a single moment in history: When a couple of rockin' slackers are at risk of failing their oral history exam. The only thing Bill S. Preston Esq. (Alex Winter) and Ted "Theodore" Logan (Keanu Reeves) care about is making their band the biggest thing to hit music since Van Halen. However, Ted's father is fed up with his son's penchant for goofing off, and threatens to send him to an Alaskan military school as punishment for flunking. This would mean Bill and Ted's music never reach the masses, and humanity's idyllic future will never come to be. 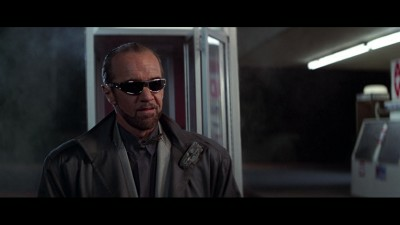 So, Rufus (George Carlin) takes a time traveling phone booth back to 1988, tells the ‘Wyld Stallyns' that the fate of the world rests in their hands, and propels them through a guided history tour they're not likely to forget. Sure, Bill & Ted's Excellent Adventure seems dumb on the surface, but it's much smarter than people give it credit for. The 80's spent a lot of time telling filmgoers that if there's something bad standing between you and your happily ever after, just sneer, say something ironic, and blow him/her/it/them to smithereens. I love films from that era, don't get me wrong, but there's something funny about film characters wanting peace in their lives… but only after Arnold Schwarzenegger mows down an entire compound with an M60E3 machine gun. This film, however, takes a different approach, and a refreshing one at that. It says that if you find yourself in a plot where you have access to something as cool as a time machine, forget the violence. Hop in that sucker, go back in time, convince the villains and tyrants throughout history to chill out, and watch utopia unfurl. And you know what the most beautiful part of this message is? It's delivered by two of the dumbest dudes on the planet, because being excellent to one another shouldn't be rocket science. Or, maybe I'm overthinking things. No matter, because even without this analogy, the film is still thoroughly entertaining. 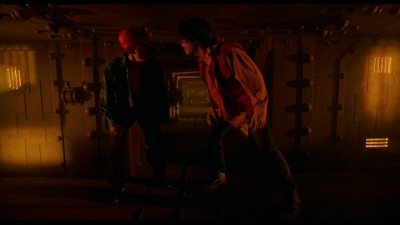 Bill and Ted may be a couple of idiots, but they're entirely lovable idiots. They're funny, loyal, and have heart. Regardless of first impressions, they prove that books should never be judged by their cover, because greatness can come from the most unexpected of places. 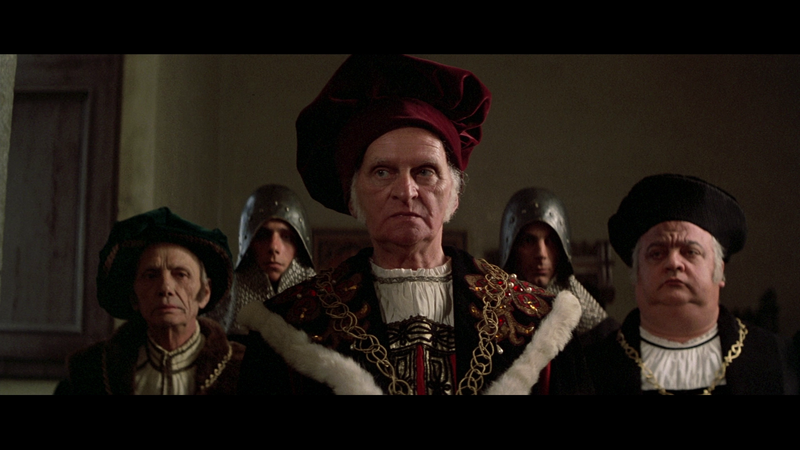 As for the film itself, it's a riot. 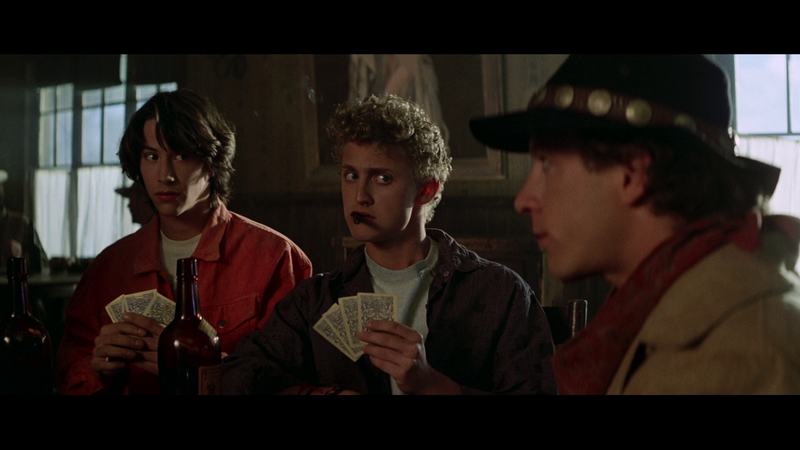 Besides how well Alex and Keanu bounce off of each other, there's plenty of clever gags which play off the historical figures the Wyld Stallyns meet throughout their adventure. Furthermore, the script and direction work quite well in tandem, as there's very little to complain about as far as pacing is concerned. Last but certainly not least, while this film had major potential to be a painful reminder of the 80's more cringey aspects, it's actually aged quite well. Bottom line, is that this film is a classic (Four Stars). 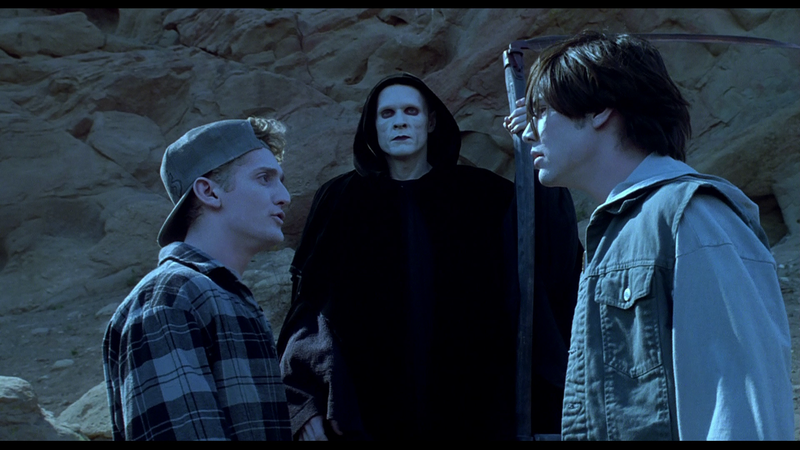 1991's Bill and Ted's Bogus Journey, on the other hand, is more of a mixed bag. That may sound blasphemous to some, as there are people that actually prefer the sequel to the original, but I'm not one of them. Five years after Bill and Ted traveled through time, they're preparing for their performance at the San Dimas Battle of the Bands contest. Problem is, despite everything they've been told, they're not that good. As a matter of fact, their medieval princess girlfriends bring more to the band than they do. But, of course, they find themselves in a familiar predicament: Either they win the contest, or humanity's future is doomed. Oh, and Ted is threatened with military school… again. 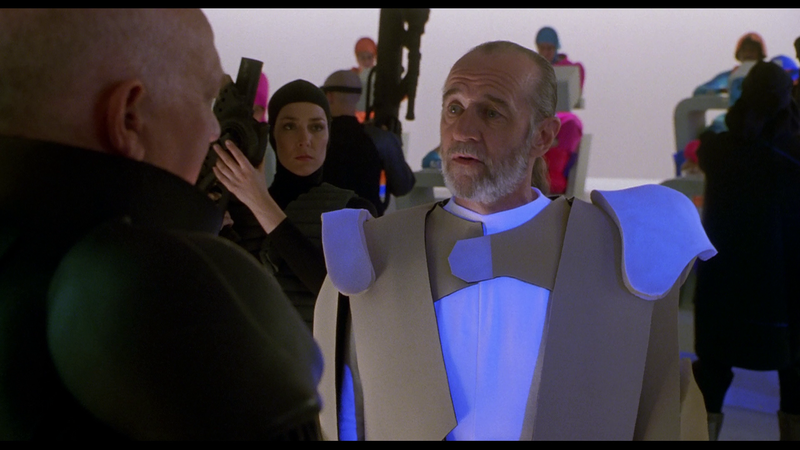 To prevent them from winning, Chuck De Nomolos, a crabby-pants from the future who's sick of air-guitar utopia, sends a couple of Bill and Ted look-alike robots back through time to kill them… and succeeds. With the real Wyld Stallyns out of the way, the robots are free to drag the names of Bill S. Preston Esq., and Ted "Theodore" Logan through the mud, while the real Bill and Ted can do little more than stand by and watch. Eventually, they find a loophole when Death challenges them to a game for their souls, and while I'd like to say the story pretty much writes itself from there, well… things get weird. The plot as I've described isn't bad, as it allows these characters to befriend additional historical figures without relying on the time travel gimmick. That alone would have been enough to differentiate the sequel from its predecessor, but the film instead opts to convolute things by exploring heaven, hell, and everything in between. The Wyld Stallyns are forced to deal with a ghoulish granny and a deranged Easter Bunny, and their encounters with both God and Satan are forgettable, at best. If that's not enough, the rest of the film spoofs possession, seances, and even extraterrestrial life. I'm sorry, but it's all too much, even for Bill and Ted. And yet, to a certain degree, Bill and Ted's Bogus Journey still manages to entertain. What can I say? There's something infectious about watching these two dolts bumble their way through the afterlife. I think what really helps this film stay afloat, though, is the inclusion of Death as a main character. 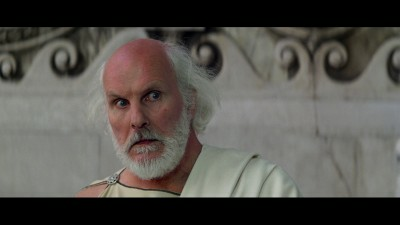 The best thing I can possibly say about this film is that its parody of Ingmar Bergman's The Seventh Seal - an odd inclusion considering the demographic this film was aimed at - is probably the funniest bit in the franchise's entirety. 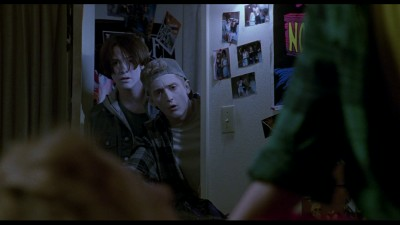 After all is said and done, Bogus Journey is just ‘okay'. 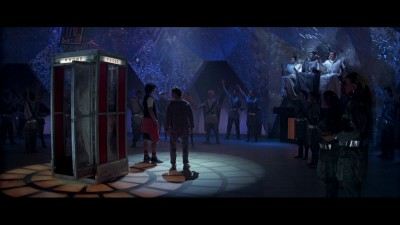 It doesn't hold a candle to the original - it's not as smart, and its message fails to inspire - but fans of these characters will likely take Bill and Ted any way they can get them (Three Stars). Bill and Ted's Excellent Adventure appears in this collection with a 1080p, AVC encoded transfer (2.35:1) which is almost identical to the previous MGM release… almost. In motion, there's really nothing to complain about. Some shots appear a little soft, but I'd wager that's due to the source, as there are plenty of others which provide a decent amount sharpness and clarity. And besides, this appears to be a clean print. There's the occasional white speck, but there's nothing offensive to report in the way of dirt or scratches. Where things start to differ is in the darkness, color timing, and grain structure. The difference between Shout and MGM's presentations aren't night and day, but rather just a hair off. On Shout's disc, the image appears to be ever so slightly darker, although contrast is still fine, and there's a slight warm push to the image. 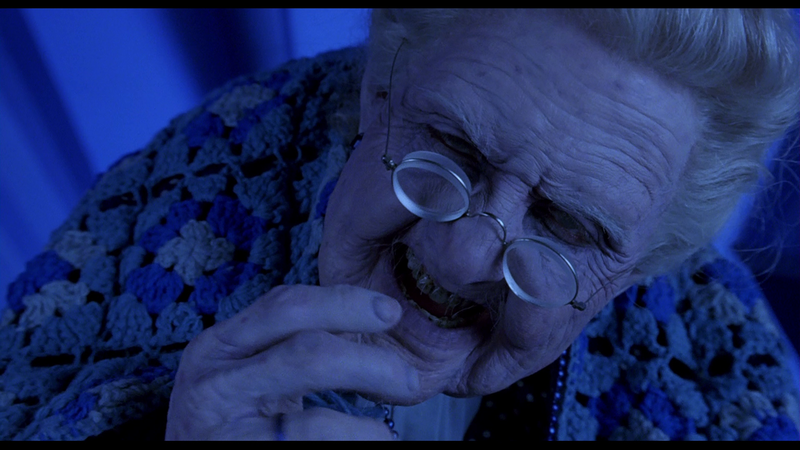 Grain fluctuates throughout the feature, although this was also true on the MGM release. However, Shout's compression is inferior to the old MGM disc, although again, you'd be hard pressed to notice it in motion. I really had to do a direct side-by-side comparison with shots on the net in order to see a difference. All in all, this is a solid transfer and should make anyone who doesn't already own the previous MGM disc pleased. Four Stars. 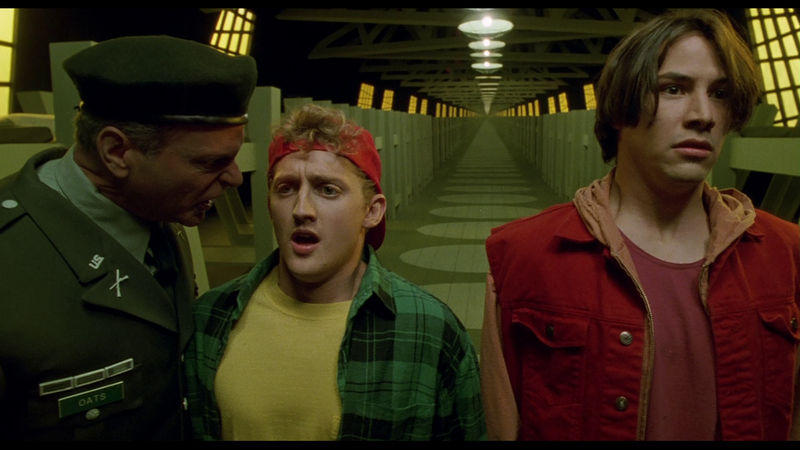 Bill and Ted's Bogus Journey arrives on Blu-ray for its first time with a 1080p, AVC encoded transfer (1.85:1), and while it has some issues, it still looks pretty darn good. Again, there appears to be some fluctuation with sharpness throughout the film, but some of this has to do with how it was shot, and at times probably a side-effect of the special effects. There's still plenty of shots that are sharp and display an impressive amount of detail, though. I'm actually surprised how good the ‘black sheep' of the franchise continues to look. Black levels are nice, as is the contrast, and colors are strong and never oversaturated. The only complaint I have in regards to this release is the compression. 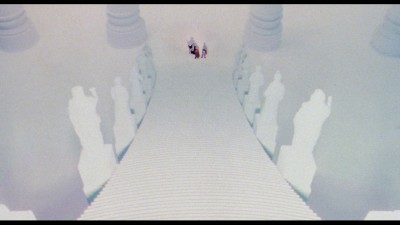 Compared to Excellent Adventure, Bogus Journey's grain structure is noticeably chunkier, and can be noticed during playback. I wouldn't go as far to say that it ever comes close to ruining the viewing experience, but it's easy to see, and probably going to be a topic of discussion once more people get their hands on this release. Overall, I'm quite pleased with the presentation that Bill & Ted's Bogus Journey got, but a little more quality control on the compression would have been nice. Three and a Half Stars (better compression would have produced a four). Both films have been treated to 5.1 DTS-HD Master Audio tracks, and they sound fantastic, even if they do come off as a product of their time. By that, I mean a fair chunk of the audio comes from the front. The dialogue is always appropriately prioritized and clear as can be, and sound effects often sweep across the front of the sound stage. When things really kick up though, the entire surround field comes alive, adding to the fun that each feature provides. 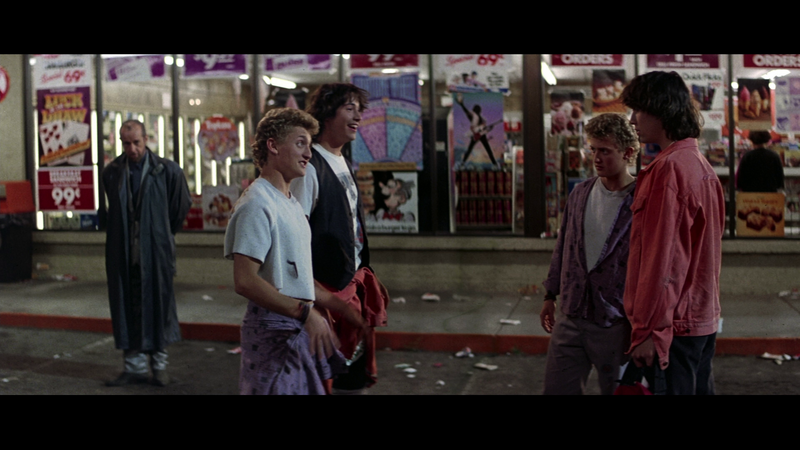 The music is especially rockin', which is the way the Wyld Stallyns would have wanted it. Again, fans will not walk away disappointed. 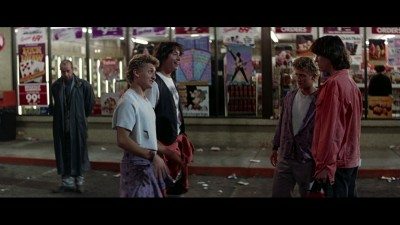 -Audio Commentary with Star Alex Winter and Producer Scott Kroopf - Considering they're talking about a nearly 30 year old project (it was originally filmed in 1987), Winter and Kroopf are loaded with information and an endearing fondness for all the ‘happy accidents' which eventually culminated into the classic we know today. This commentary is not to be missed. 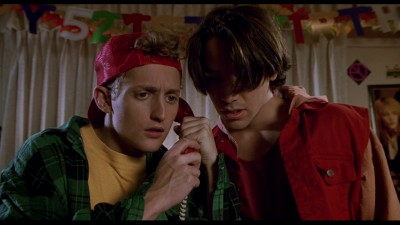 -Audio Commentary with Writers Chris Matheson and Ed Solomon - These were the guys that made Bill and Ted what they are, and like Winter and Kroopf in the previous commentary, they remember every little detail and lay them all out for us. There's lots of good info on the production and behind-the-scenes bits, as well as some of the ideas that never made it into the final product. -Audio Commentary with Star Alex Winter and Producer Scott Kroopf - This film may be weird, but Winter and Kroopf obviously believe in what they've done, and speak as fondly about this project as they do in the commentary for the original. -Audio Commentary with Writers Chris Matheson and Ed Solomon - The writers have plenty to say about the sequel, and often crack themselves up over certain ideas or how things went down behind-the-scenes. What's especially interesting is that they address the ‘thrown together' vibe of the film, from both creative and editing standpoints (although I really didn't mind the edit that much). -Time Flies When You're Having Fun - A Look Back At A Most "Excellent Adventure" - Clocking in at just over an hour, this feature is basically a documentary about the original film that's been lovingly pieced together for our viewing pleasure. Everyone involved in the creative process, including actors Alex Winter and Keanu Reeves, sit down and provide a complete rundown of all the pertinent info for us. For those who love informative companion pieces, especially people who don't really like to carve out time for full length commentaries, this is the ultimate feature for you. -Bill and Ted Go To Hell - Revisiting A "Bogus Journey" - Likewise this 52 minute documentary covers all the goods on the second film, in very much the same way the previous documentary did for the first. Again, I was most interested in how the writers sort of acknowledge that the main selling point of this film is just how far ‘out there' it is. -The Most Triumphant Making Of Documentary - This is a half-hour documentary originally appeared on the old DVD's, and while it appeared to be missing on the MGM Blu-ray release from 2012, Shout has managed to secure it for this release. Honestly though, the previous documentaries absolutely blow this feature away, but it's still nice to have for competion purposes. 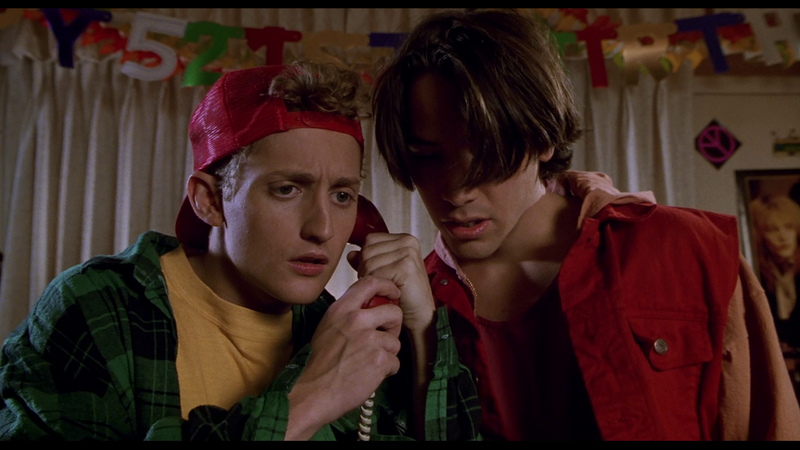 -The Original Bill & Ted - In Conversation With Chris and Ed - Another old featurette, the writers spend about 20 minutes discussing how they came up with the idea for the original film. -Score! An Interview with Guitarist Steve Vai - A nearly 13 minute interview with the legendary guitarist discusses how he can see a bit of himself in Bill and Ted, as far as them being air-guitarists and actual musicians. 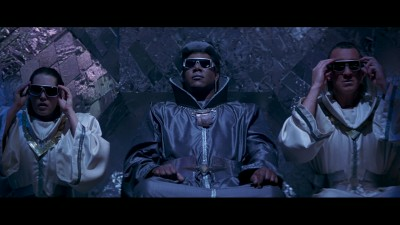 He eventually moves on to discuss how important the soundtrack itself was for the film. 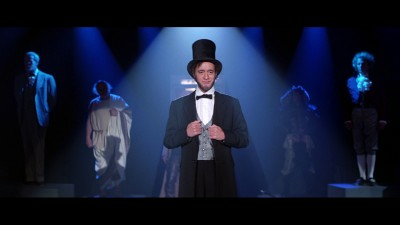 -The Hysterical Personages of Bill & Ted - This 15 minute featurette is something of a satirical look at the numerous historical figures which features in Excellent Adventure. -Air Guitar Tutorial - "Bjorn Turoqe" and "The Rockness Monster", actual air-guitar champions, give some pointers on how to rock out without whipping a real guitar out. 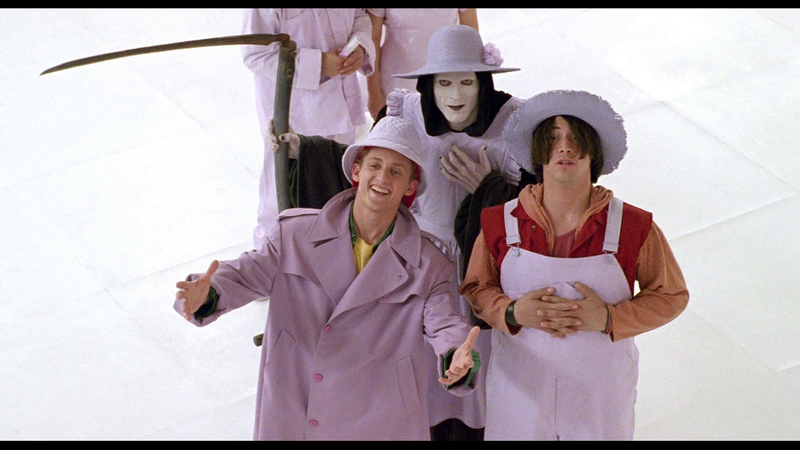 -Vintage EPK - This 6 minute featurette briefly goes over the ‘absurdity as a driving force' behind Bill & Ted's Bogus Journey, with some behind-the-scenes footage to boot. This mainly serves as a promo piece, however. -The Linguistic Stylings of Bill & Ted - Just under 4 minutes in length, this featurette basically recaps the most noteworthy quotes of the franchise's main characters. Also included is a guitar pick and a couple of bumper stickers. Shout Factory have basically become the last bastion for quality catalog releases, especially now that major studios are resorting to MOD (manufacture on demand) BD-R's and digital-only futures. They've really stepped up their game in the last year, too, and with the release of Bill & Ted's Most Excellent Collection - which wholly lives up to its name, by the way - they apparently don't have the intention of stopping anytime soon. The A/V presentation is better than expected, even for Bogus Journey. And supplements? Not only are most, if not all of the old extras accounted for, but Shout went to great lengths to produce a good deal of their own. This is one of the easiest ratings I've given to a release in a while: Highly Recommended.